These simply clip onto the weatherboard you've just fixed and set the board above it perfectly parallel and at the correct angle and measurement. All you need to do is fix the board to the wall and move on. No double or triple checking, the K-Strip at the bottom ensures the accuracy of the first weatherboard, the Handbracket takes its measurements from that. 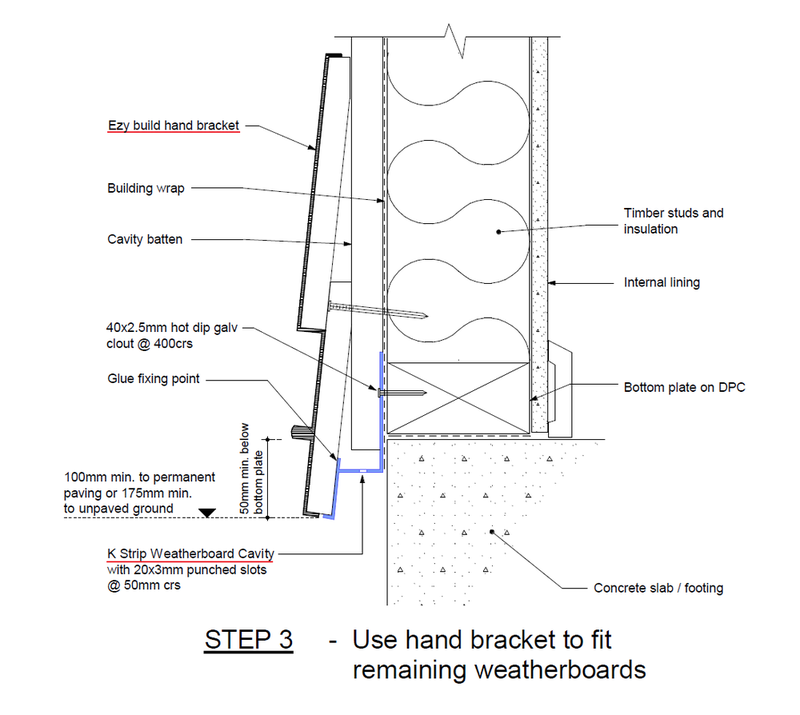 The Fast Clad Hand Bracket allows weatherboarding to be installed quickly and accurately without the need for storey rods. When used in conjunction with the K Strip Weatherboard starter, cladding time can be reduced by up to 50%. The Fast Clad Hand Bracket is a fixed sized spacing removing the chance of the spacing being uneven. There are three different size Hand Brackets available 135mm, 150mm, 180mm and they come in pairs. Cut Weatherboards to required length. Prime/Seal end cuts and bottom edge of bottom Weatherboard. Fix first weatherboard using EzyBuild K-Strip. With 2 people, using a Fast Clad Hand Bracket each clip the next weatherboard into the Hand Bracket then position using the already fixed off weatherboard. Push firmly up and fix weatherboard off to manufacture's specifications. Repeat process until remainder of weatherboards are complete.